First of all, we have the capital. With its two airports, Bangkok offers connections to and from Krabi almost every hour, keeping in mind that national carriers like Thai Airways and Bangkok Air also fly the same route, you can choose the best times that work with your arriving flight in Thailand (if your program doesn’t include an intermediate stop). There are 5 direct flights a day from the north airport of Bangkok (Don Muang). Prices start from 2,000 THB round trip, but can get up to 4,000 THB and more, in high season, such as Christmas. For the same amount of money you can also take a flight on Nok Air. Unlike Air Asia, there’s just one flight a day. The convenience of Nok Air is that once you land at the airport in Krabi, included in your air ticket you also get a minivan that will bring you to the main beach (Ao Nang Beach). Another low cost carrier that offers flights from Bangkok to Krabi is Thai Lion Air. Like all economy airlines, this too leaves from Don Muang airport. There are 5 daily direct flights to Krabi (and vice versa), for a price starting at 1,500 THB (round trip). Thai Airways offers just one connection a day from the largest airport in Bangkok: Suvarnabhumi. Ticket prices are higher than those of Air Asia or Nok Air, starting in fact at 2,680 THB a person for a round trip ticket. Bangkok Air has 3 direct flights a day from Suvarnabhumi to Krabi, and another 4 flights with a stop on the island of Koh Samui. Round trip flights start at 3,000 THB a person. From the bus station in the south of Bangkok there’s a good 8 daily runs, provided by the company “Lignite”. In the morning there’s just one connection (scheduled for 7:00), the rest of the trips are in the evening, from 5:30 p.m. to 8:40 p.m. Travel times take about 12 hours, and tickets start from 629 THB (if the bus stops at Nuea Khlong), or from 643 THB (if the last stop is at the city’s bus station). There are also buses that leave from the Hualamphong rail station. In 20 hours you can arrive right at the beach of Ao Nang. In this case a ticket costs 1,200 THB. Even from the backpacker section (Khao San Road), you can get to Krabi by bus. A ticket costs 900 THB if you stop at the Krabi Andaman Wave Master tourist agency, 1,000 THB for Ao Nang Beach. In the first case it will take 14 and a half hours, 16 for the second. Keep in mind that both trips only travel at night, in fact they both leave at 6:00 p.m. from Bangkok. The train and bus combination: leaving from Bangkok;s central station (Hualamphong), take train number 85 at 7:30 p.m. towards Surrathani. It takes 12 hours of travel, and once you get to the station of Surrathani at 8:00 a.m., you can then take a bus from the company called “Phantip”, headed toward the bus station in Krabi, for another 3 hours. You can buy this combination on 12go.asia for a total price of 1,839 THB, if you want to travel in first class, or 1,308 THB, for second class carriages with air conditioning. For those who desire the most exclusive comfort and prefer private transportation, again on 12go.asia you can find taxi services willing to take you as far as Krabi for prices starting from 13,300 THB. From the north of Thailand, thanks to Air Asia, you can take two flights a day for Krabi, but only from Chiang Mai. Flight times are obviously longer than those from Bangkok: 2 ore.
Nok Air also runs this route, but doesn’t have direct flights: you’ll have to stop in Bangkok and then take a second connecting flight for a total one-way cost starting at 1,000 THB. If you’re on Koh Samui, you can take a direct flight with Bangkok Air. If instead you want to travel by sea form the island’s two ports (Bangkrab and Nathon) there are a total of 8 daily connections: the first at 8:00 a.m. and the last at 3:30 p.m. From Koh Samui there’s also the possibility of taking a bus that will bring you right to the beach at Ao Nang. It starts at 7:30 a.m. and takes 7 hours. If instead you’re on Phuket or Phi Phi Island, you can take a ferry or bus. Among internet sites Phuketferry and 12go.asia, you can easily buy ferry tickets online, paying with a credit card or with your PayPal account, printing them, then presenting them before you leave. From Phuket for example, there are 5 trips a day (from 10:30 a.m. to 5:00 p.m.). The only direct ferry, which takes 2 hours to get to Krabi, is at 10:30 a.m. With all of the others you’ll get to Krabi in 8 hours, since they first go to Phi Phi Island. If you’re already on Phi Phi Island, you can get to Krabi Town in and hour and 45 minutes, with various daily ferries: at 9:00 a.m., 10:30 a.m., 1:30 p.m., 3:00 p.m., and the last at 4:00 p.m. If instead you want to go right to Ao Nang beach, there’s only one trip a day at 9:30 a.m. The same goes for transport to Railay Beach: it takes an hour and 45 minutes, leaving at 9:45 a.m. Regarding buses from Phuket, they all leave from the capital’s station (Phuket Town). Tickets cost 150 THB a person for an air-conditioned seat. Once you get to Krabi Town, if your hotel is located along Ao Nang Beach, you’ll have to take another bus for 40 THB. If instead you want to travel directly without having to change onto 3 different buses, then I recommend that you take a minivan which from Patong will bring you right to the beach in Ao Nang for 650 THB. From further places like the island of Koh Lanta for example, you can get to the two main beaches of Krabi (Ao Nang e Railay) in 2 hours, at 10:30 and 10:45 respectively. There are just five connections from Koh Tao: 6:00 a.m., 6:30 a.m., 9:00 a.m., 9:30 a.m., 10:00 a.m.. It arrives at the beach in Ao Nang, and a ticket costs 1,000 THB, for 8 total hours of travel. Koh Phangan instead has 9 trips toward Krabi. The first at 7:00 a.m. and the last at 2:30 p.m. There are no direct flights from the major Lao cities like Vientiane, Luang Prabang, or Vang Vieng, to Krabi. All flights stop in Bangkok. The same goes for Cambodia, Vietnam, and China, reachable via flights that stop mainly in Kuala Lumpur. 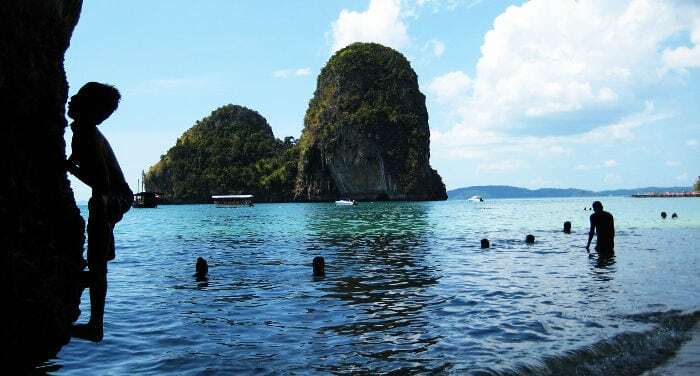 Once you land in Krabi, you have a few choices for getting to your destination, depending on if you’re staying in Krabi Town, Ao Nang, Railay, or one of the further beaches (Ah Phra Nang and Tonsai, south of Ao Nang, or to the north, at Hat Noppharat Thara and Klong Muang). The bus that serves as a shuttle between the airport – Krabi Town – and Ao Nang beach costs 150 THB a person. The trip takes about 45 minutes. It’s very hard, if not impossible to find a taxi driver in Thailand that turns on the meter; the only exception is Bangkok. And especially in the islands like Phuket. The same also goes for Krabi, so if you take a taxi figure on a minimum of 600 THB per car. Click here to see the best hotels in Krabi. Krabi Town, a town with a population of 60,000, is located almost 20 kilometers from Ao Nang beach. Since Krabi Town isn’t on the water, personally I don’t think it’s worth staying in town, especially if your vacation is meant for relaxing at the beach. Nevertheless Krabi Town offers great accommodations, slightly less expensive than those near the beach. There are almost 200 hotels in the city, and have something for all budgets. Among the least expensive there’s “No.7 Guest House”, located along the banks of the Pak Nam River. Among the nicest there’s the “BB Pool Villa” and “Baan Pak Rorn”, both with outdoor pools. Prices at the Baan Park Rorn start at 5,000 THB a night for a double room. The BB Pool Villa is a two-room house which can be rented for 9,000 THB a night. The most beautiful hotels and resorts are located on the two main beaches: Ao Nang and Railay Beach. Ao Nang is the most popular beach, where you can find bars and restaurants for tasting the excellent local cuisine. Just as in the middle of town, in Ao Nang you can also rent entire villas with more rooms and private pool. One example is the “Baan Ari Pool Villa“, located a little far from the beach. The price for the whole villa with three double rooms is 16,000 THB. Railay Beach (divided into an eastern and western part) is more peaceful, and there are various luxury resorts. The only way to get there is by boat. There aren’t any roads, neither from Krabi Town, nor Ao Nang beach, that go to Railay. The San Sea Resort for example, is a 3 star hotel located a few meters off the water, on the western part of the beach. On the eastern part there’s the Bhu Nga Thani Resort & SPA. The majority of restaurants, and the heart of the nightlife, are located near the beach at Ao Nang, as well as inland. The choices are quite varied, you can find Thai restaurants, as well as international food (Italian, Indian, Japanese, etc). All activities in Krabi are tied to the beach or natural in general. In Krabi Town there’s practically nothing to do other than shopping in the stores in the center or stopping to eat in the typical local restaurants. The best part of Krabi are its wonderful beaches and the nature that surrounds them. The most beautiful beach is Railay Beach (western part). This beach is very long with light sands and clear water, surrounded by palms and mountains covered by actual jungle. The beauty of Krabi’s beaches is due also to the vegetation that surrounds it; but if you’re looking for truly spectacular water then I recommend that you got to Phi Phi Island. The only way to reach the beach is by a small wooded boat, the so-called “long-tails”. There’s no pier on the beach, so (just like the main beach on Koh Samet) you get off the boat directly into the water. On this beach you can find local restaurants and bars which creates a very evocative atmosphere when the sun goes down, with colored lights and lanterns. On the eastern part of Railay Beach you can’t swim, since the seabed is very muddy and when it’s high tide the beach disappears. The two beaches on Railay are connected by a small path that will allow you to shuttle between the beaches in ten minutes. Another beautiful beach, first classified together with the western part of Railay Beach, is Ao Phra Nang Beach. This beach is situated about a 20 minute walk from Railay Beach, and to get there you have to take a path through the jungle where if you’re fortunate you might also see some monkeys. Another way to get there is by boat. From Ao Nang beach there are various tours that will bring you to Ao Phra Nang; in fact (thanks to its crystalline waters) this beach is very popular among tourists and locals. The beach with more entertainment and tourism, is Ao Nang Beach. Unfortunately due to its location to the west on the Andaman Sea, it isn’t protected and during the rainy season (but not only!) it is highly probably that it will rain, there will be wind and temperatures will drop a bit. The beach itself isn’t particularly beautiful; actually it’s very crowded especially in the high season. Just like Railay Beach, Ao Nang Beach is also surrounded by rocky mountains fully covered by forest. Around the beach you can find hotels, restaurants, and bars open until deep into the night. From this beach boats leave for Railay Beach, and you can get a personalized tour from one of the many tourist agencies in town or in your hotel. Tonsai Beach is the most distinctive, since it isn’t a beach for swimming (the strip of sand is really reduced and at high tide it disappears), but thanks to its rocks, it’s a place for practicing climbing. Tonsai is in fact a very opular destination for fans of rock climbing. A few of the most famous schools are Basecamp Tonsai (a day of climbing and lessons costs 2,800 THB) and The Rock Shop (a store that offers personalized climbing courses). The advantage of Tonsai Beach is that it has very inexpensive guest houses and restaurants. A distinction of the area is that there’s no electricity during the day. Ao Phai Plong Beach is located just 5 minutes from the boats of Railay Beach. The beach isn’t very big but it can be considered a place to relax and enjoy nature; it’s also much less crowded than nearby Ao Nang. The only hotel located directly on the beach is the Centara Grand, a luxury five star resort where a double room costs some 6,000 THB a night. Ao Nopphara Thara Beach is a 3 kilometer long beach divided in two by a stream. The western part is the most beautiful and relaxing. It can also be easily reached by boat; the ground route is much longer and many tourists are discouraged by this. In general both parts of the beach aren’t a big deal, the convenience is if you want to find cheap lodging yet still be close to the nightlife in Ao Nang, you have a vast choice of guest houses and hotels. Klong Muang Beach and Tubkaak Beach are the most peaceful beaches on Krabi. Personally I think they’re best suited for older people and families with children. The water and beaches aren’t anything great, it wouldn’t be worth traveling 12 hours by air just to visit these two places. During the low season the beaches become slimy and almost impractical. Being located 30 minutes from Ao Nang, it is also rather inconvenient for getting around every night in search of some entertainment. Around Klong Muang and Tubkaak there are few restaurants and the majority of tourists eat in the resorts where they’re staying. One of the symbols of Krabi are the Khao Khanap Nam caves. They are located on two hills higher than 100 meters, and can be reached only by boat from the port of Chao Fa. The trip takes just 15 minutes, and to rent a boat for an hour they ask 400 THB and up. Another famous cave, located about 10 kilometers north of Krabi, is the so-called Tiger Cave. Inside you can see impressions of tigers on the rocks. The area around the cave is also a Buddhist temple, an important one since there have been archeological discoveries such as ancient tools and even Buddha’s footprint, or the “cemetery of shells”. On this beach you can find lots of shell fossils going back more than 40 million years ago. Apparently, according to the local guides, there are only two other places in the world where these exis: one in Japan and the other in the United States. A very popular activity among tourists that is heavily advertised by local travel agencies, are the Nam Tok Rawn waterfalls (in Thai: น้ำตกร้อน), located in the district of Klong Thom, in Khao Phra Bang Khram National Park. The appeal of this place is that the water goes out from thermal falls into natural pools at a temperature going from 32 to 45 degrees centigrade. This hot and salty water is considered healthful by the locals especially because it contains important elements for fighting rheumatism, sciatica and much more. Near the falls there are also changing rooms for allowing visitors to get into their bathing suits and leave their stuff. In the same area you can also find Crystal Pool (also called Emerald Pool), a natural pool where crystal colored water comes out. Here too you can swim and the water is comfortable. The pool can be easily reached on foot by following a 1.5 kilometer path through tropical forest. At 600 meters above Crystal Pool there are other natural pools, called Blue Pool, due to the intense blue of its water. An entrance ticket to the falls is 90 THB, while for the whole national park you pay 200 THB a person. There are lots of agencies that offer these tours from Krabi. Prices start at 900 THB for a full day at Emerald Pool and Nam Tok Rawn waterfalls. Island tours, with the chance to do some snorkeling, dinner on the beach and swimming with Plankton (small aquatic organisms) that light up at night. The price is around 1,500 THB. Half day canoeing (700 THB): for this tour I recommend that you don’t use very touristy operators; this way you won’t have too many people and will have more time to fully enjoy the adventure. I recommend that if you haven’t already done so, to take out a health insurance policy that will cover your entire stay in Southeast Asia. In Thailand there are cutting edge hospitals, especially in the capital Bangkok, where every year many foreigners go for cosmetic surgery. Nevertheless, if something serious should happen to you, such as a scooter accident or an illness where you’ll need to spend a few days in the hospital, the price will be very high. In some times of the year, the Thai beaches, and seas, are heavily filled with jellyfish, some of which are dangerous. For this reason some tours don’t allow clients to snorkel or take a dip. Before buying a tour find out what the situation is so as not to have to stay on the boat the whole time without doing anything else. If you decide to rent a motorbike or scooter, know that the Thais have decided that international drivers licenses aren’t valid in their country. If the local police should stop you, the perfect excuse they’ll use for getting some money out of you (usually around 400-500 THB), will be to tell you that your license isn’t valid.If you live in Thailand for some time and have a local drivers license, you’ll find another excuse to give you a ticket, whether it be the lights or something else banal. In Krabi you can easily buy things with credit cards or exchange money into local currency at bank counters around town. Be very careful to not use ATMs located in hidden corners, but rather official bank ATMs. Many tourist find phantom charges due to someone cloning their credit card. In this delicate moment for the Thai people, I recommend that you avoid demonstrations (if they should happen), as well as speaking about politics or the death of the king (which happened in the Fall of 2016, and whose funeral will be held on October 26th of this year).